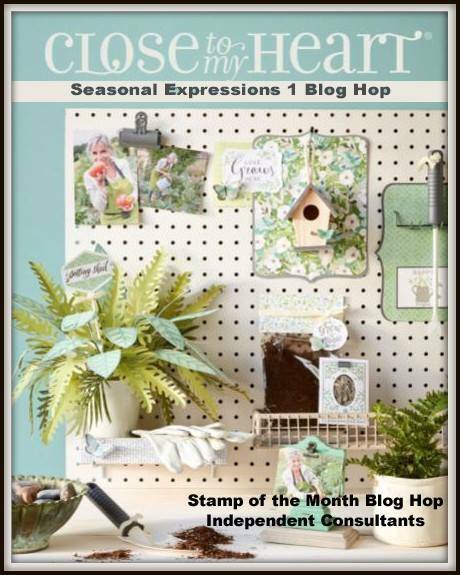 Welcome to our Seasonal Expressions New Product Blog Hop! Today our bloggers are sharing their artwork created with products from our newest Seasonal Expressions book that was released on January 1. This is hop will be fun. I can't wait to see what every has created. If you came here from Melissa Robinson's blog, you are on the right track! The hop is a big circle so when you get back to me, you will know you have visited everyone's blog! 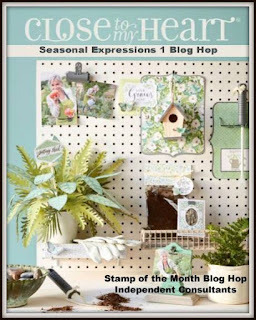 Today I am showcasing the Cross-Stitch Love Stamp Plus Thin Cut. I LOVE this stamp. I couldn't wait to try this stamp out. The shading you see in the cross stitch pattern is from stamping it just one time! The set comes with three coordinating thin cuts - one for each flower. I wanted to try out a technique I saw using the thin cuts to showcase the stamp by stamping the image on the base of the card front and using the Thin Cut in a popped up layer. So, how did I know where to place the thin cut on the mat? First, I cut a mat to the size I wanted on front of the card. Then I ran the mat through my cuttlebug with the Rose Embossing folder. Next, to get perfect placement with the thin cut, I placed a piece of vellum cut the same size as my mat, on top of my stamped image. I placed the thin cut on top and used washi tape to hold it in place. Then I placed the vellum and thin cut directly on top of the mat and ran it through my cuttlebug. I used our foam tape under the mat to pop it up. 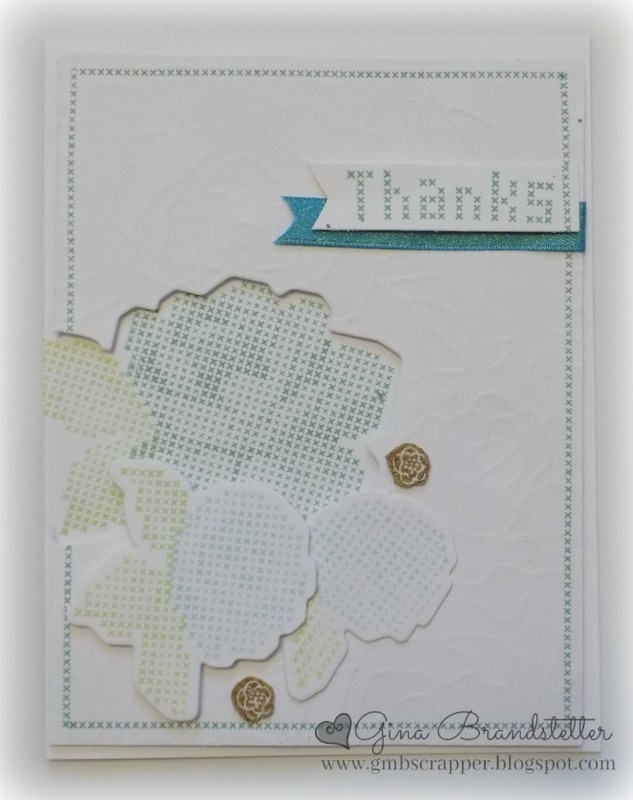 I used stamped the smaller flowers directly on the thin cuts and layered them on the card. This was a fun technique to try. Or contact your Close To My Heart Consultant! Now it is time to visit Alyson Mayo's blog! Lovely. The layers are wonderful. Very pretty card with great use of that stamp set! 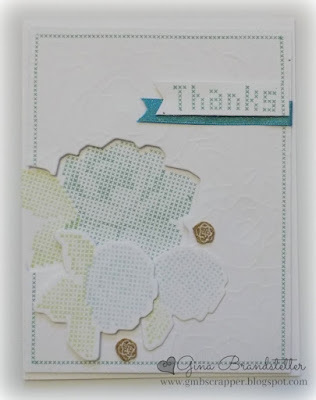 Love the layers, the cutout, with the cross stitch stamps and embossed flowers. great card. Such a pretty card and, since I have this card in person ;), I wish this picture showed more of the beauty of the dry embossed roses in the background too!! Love it! What a fun technique! You've inspired me! The layers and cut to are so creative and pretty. Great card. This is a stamp set I hadn’t decided about yet... I love what you did here, though. The cross stitch effect is so neat when stamped. Thanks for the inspiration - you may have just changed my mind about needing this stamp set after all! Very pretty dimension to your card! What a great card. I love how you used this stamp set.